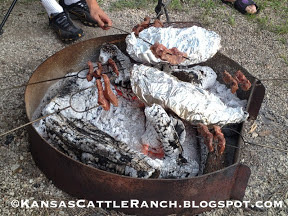 Kids, Cows and Grass: Camping food -- rancher style! Camping food -- rancher style! Campfire food, of course, includes beef!! 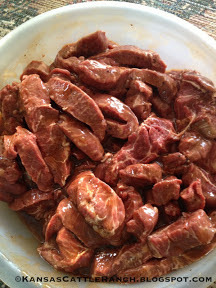 This is a big bowl of flat iron steaks sliced about an inch thick, marinating in mesquite. 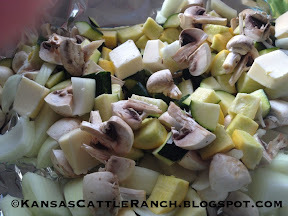 The side dish is sliced zucchini squash, yellow squash, sweet onion, and mushrooms with a bit of butter and garlic salt wrapped in two layers of foil and cooked on the campfire coals. My favorite part of camping is everyone cooks their own meal! 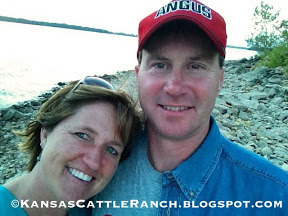 Duane and I enjoy the occasional break from the ranch with the kids camping at the lake!